In 1969, the Classics IV released the single, “Traces.” It made it to #2 on Billboard’s Hot 100, and it was BMI’s top 100 songs of the century at #32. “Traces” has had many lives over the years being covered by many artists. With the exception to “Colour My World,” “Traces” probably has been played at more oldies parties, dances, and high school proms than most. “Traces” is a piece that many can relate to. It has the earmarks of past relationships, fitting and unfitting. 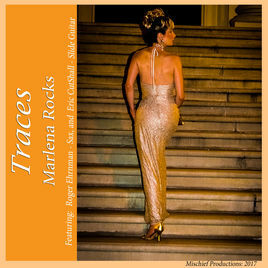 Running the clock up to summer 2017, west coast jazz/blues artist, Marlena, has brought “Traces” back to life. A beautiful artist covering a beautiful song, Marlena takes this vintage piece to a new level. Her voice compliments “Traces”. I love the how the sax introduces and concludes this piece. As the sax’s ending drifts away in silence, it reminds me of one’s past.